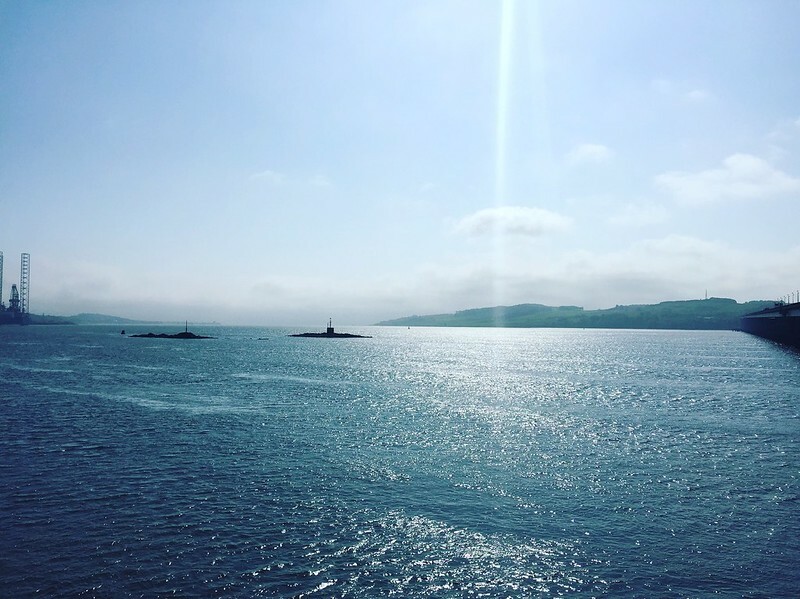 The view on Dundee’s waterfront out across the River Tay. As noted above, I was asked to basically do a talk explaining what radical librarianship is. Even for someone involved in it from the start, this was a fairly daunting task. I would argue that all of us engaged within the Collective have slightly different perspectives about what radical librarianship actually is. Not wildly different, but marginally different. This is probably not surprising, we come at this from different experiences, different backgrounds and environs, it’s not much of a surprise that we might have slightly different perspectives on the concept. For me, I hold to Angela Davis’ definition of “radical” – that it is about grasping things at the root. I see this in two respects: understanding the root causes of the issues we face (ie capitalism and, in particular, the neoliberal orthodoxy) and the roots of the profession (ie professional ethics and the values which are fundamental to the profession). So it was this dual interpretation that I decided to focus on. I won’t go into the presentation itself in too much detail (I have a rough outline of a script here [ODT] and the slides are available below and original PDF is here – fonts render better on the original PDF compared to Slideshare), but I will explain the rationale behind the structure/content etc. Unlike some of my fellow RLC-ears, I’m not so good at the theory/philosophical stuff. For me, having come from an English Literature/History background, I tend to very much take an historical approach to my thinking. I look at and interpret historical events and use those to form the basis of my views and perspectives. For example, in my presentation I used the example of Chile, the coup against Allende and the policies of Pinochet to inform my views on neoliberalism, rather than the theories of Hayek and the economic thinking of Milton Friedman. I guess, ultimately, I’m more interested in the actual outcomes of political ideas than the theories and ideas that underpin them. I like to think (and I very much hope this is the case) that providing a historical perspective can be easier to engage with than heavy theory (although I appreciate not everyone is as enthused by history as I am). 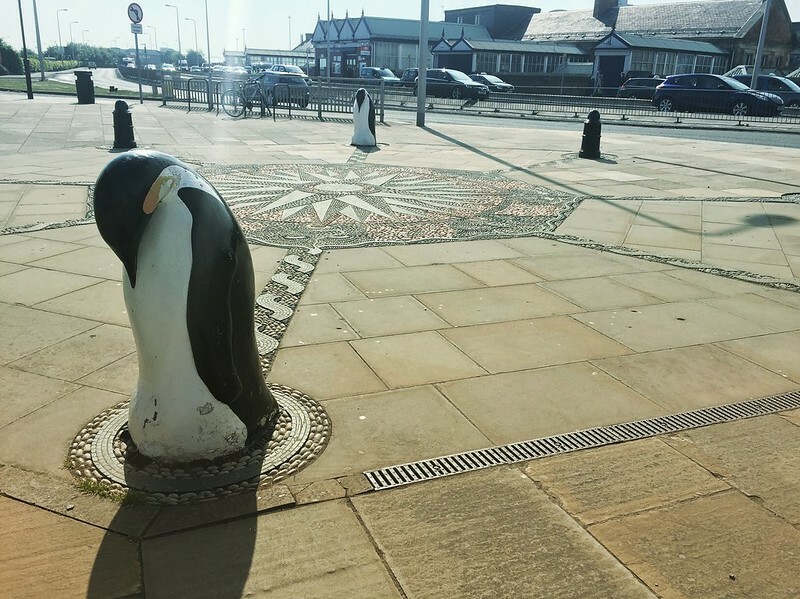 The oppressed penguins of Dundee. In terms of the structure, I decided early on I want to lay out a few themes and define them clearly to help establish some foundations on the talk. To that end I decided to outline how I interpret the word “radical” as well as explaining what “neoliberalism” is. Fortunately with the latter I came across an excellent article exploring neoliberalism which had a neat summary explaining the difference between laissez-faire, a planned economy and neoliberalism. It’s probably, for me, the clearest explanation I have come across and really underlines how it operates as a thing (hopefully if you read it you’ll agree!). As with other sources I used in preparing my presentation, I decided that I would add this to a list at the end of the presentation, highlighting not only resources I used in preparing it, but also other resources on related issues that I think people might be interested in. It did take up five slides, but I hope people find at least one text there of interest that they hadn’t come across before. I also wanted to explore things such as surveillance and the myth of neutrality, as well as giving some examples of things that we have done in the Collective since it emerged. Surveillance in particular is a topic I’m very keen on us as a profession engaging in (this seems like a good place to plug my recent article…). Indeed, I was really pleased that that issue came up a few time throughout the conference in a number of different sessions and keynotes. In terms of the other talks during the two day conference, all the keynotes were interesting in a variety of different ways. I was very much interested in the issues raised by Colin Cook, head of Digital Public Service for the Scottish government – I particularly liked the use of the term “digital participation” rather than “digital inclusion”. The former, for me, speaks of the importance of activity rather than just equal access. There’s something deeper and more meaningful about the notion of individuals participating rather than just being included. Again, this raises the question of surveillance and the impact of this upon the extent to which people can participate (marginally, because of the divide between those who can seek information online and those that cannot). Gary Green talking about the most excellent Library A-Z Project. Given the #ipbill is going through parliament today and the historic issue around individual liberty/privacy in the UK, what do you see we can do to protect intellectual privacy here? Stuart’s response was basically we need to keep engaging and pushing in this area…particularly working with other groups (for example Open Rights Group) to help push forwards with this. I certainly think collaboration with ORG could lead to some very profitable developments for the profession, and I really hope something can move forward and develop in this area. Other keynotes included Jan Holmquist (who I finally met having first made contact with him back in about 2009 when my local authority were looking at introducing ebooks and I was charged with investigating the possibilities), who talked about some of the interesting initiatives he has been involved with, particularly emphasising the notion that we should “think globally and act locally”. And we also had author James Robertson who delivered an entertaining talk with some interesting reference points, not least the reference to v. by Tony Harrison (not the pink bladder from the Mighty Boosh obviously…). Other sessions I attended during the conference included Scottish PEN talking about some of the assaults on free expression across the world (again, the Investigatory Powers Bill came up here), which was very interesting yet depressing at the same time. I also got to see my good friend and colleague Gary Green delivering a talk on the Library A-Z Project, how it came about, how it was delivered and where it is now. It’s a great project and one that deserves a huge amount of credit, not least in the original way in which it seeks to advocate for libraries with key influencers and decision-makers (to use those rather euphemistic terms we use to describe people that wield power). 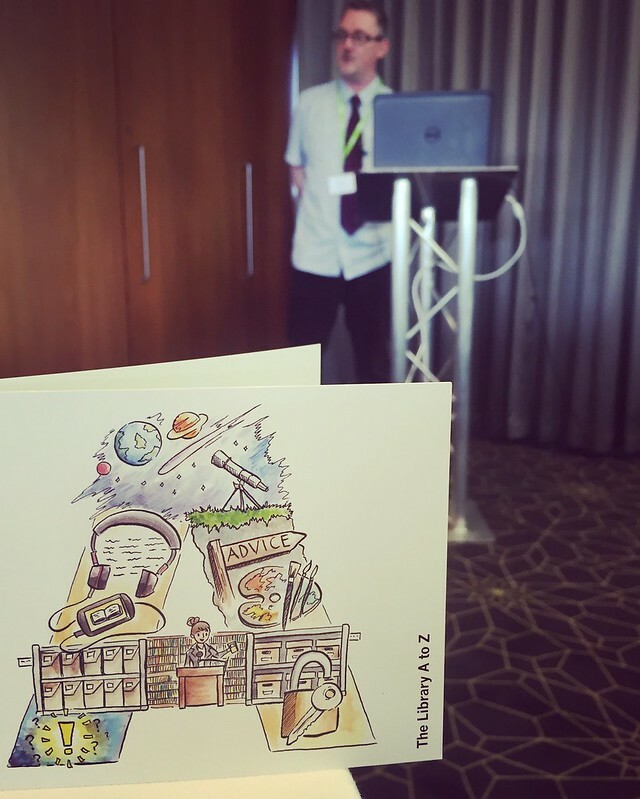 I’ve not been to many CILIP conferences over the years (although I have been to a fair few conferences now), but I really did enjoy this one very much. There seemed a good atmosphere and everyone seemed positively engaged in the conference as a whole. I certainly came away with plenty to think about, which is always a good sign about a conference (who likes a conference where you come away never thinking about the issues raised?). This came up a lot during many of the talks I attended. Now, I don’t want to disparage this idea too much. I understand the safety that libraries offer. What I would argue, however, is that they offer a particular kind of safe space – a safe space free from violence that manifests itself physically. I’d argue, however, that libraries are more vulnerable to the kind of abstract violence against the individual employed by the state and its actors. So, for example, I would argue that libraries are not (currently) immune from mass surveillance. As a consequence then, is the space offered in the library no longer a safe one? Because you are ultimately protected from physical violence by person[s], but you are not immune from state violations upon you mentally. In a library you can only ever be safe from physical violence, not other forms of violence, perhaps? One of the questions that cropped up was one that I had pretty much expected: isn’t it already too late – too late to tackle neoliberalism and the state we are in? To which I return to my history (because that’s ultimately how I try to understand the world). In Chile during the height of the Pinochet regime, change seemed nothing but a hopeless dream. But change happened. Although progress is slow, the forces of opposition to the Pinochet reforms are gaining strength. Reversal of reforms looks like a realistic possibility at last. The same is true throughout history. Societies are never static, they are ever changing. The challenge is to ensure that we are the ones that seize the opportunity to achieve change. I think that is possible. In addition to this the broader picture regarding professionals also cropped up (I forget where this came up, I think possibly this was also at the end of my talk, but forgive me if the detail is hazy). My wife works in a different profession and I see the same issues there. Professionals have been the biggest culprits of our current malaise. They have broadly become (you could argue they always have been) apolitical in nature. The politics has been completely stripped out of our professional existence. Some might argue this is a net consequence of neoliberalism which, ultimately, seeks to replace ethics and values with one sole consideration: market exchange (I would subscribe to this). What I see RLC doing is tackling this head on within our own profession. Forcing people to confront our values and seek out ways to ensure that our ethics are defended against an assault by an ideology hostile to ethics, values and principles (because they obstruct the process of market exchange). Librarians can’t save the world, but they can save their profession. Further, if all professions were to vigorously defend their values and principles and seek solidarity with others across professions then, yes, maybe we could effectively block some of the hostile forces ranged against us and our communities. Who knows, maybe collectively we could halt the progress of neoliberalism, push back and reclaim territory. Maybe. Can librarians change/save/liberate the world? No, emphatically not. Can people? Absolutely. It is easy to be disheartened in the battle for change. The forces defending the status quo are very strong. Here in the UK, we very much exist in a country that has rarely seen dramatic change and has instead drifted down a particular course with very little deviation (I can think of maybe two real examples in the last century – the immediate post-war Attlee government and the Thatcher government). As I said in my talk, I know that the world I want to see won’t emerge in my lifetime (if at all). The important thing for me, and the thing that keeps me prepared to battle, is to remain idealistic in my goals, but realistic in my expectations. It’s the expectations that will kill you, it’s the idealism that makes you feel alive. FREE MARKET LIBERALISM: Smith, A. (1776). The Wealth of Nations. RLC OVERVIEW: Arkle, S., Brynolf, B., Clement, E., Corble, A. & Redgate, J. (2016). Radical Librarians Collective: An Overview. Post-Lib, 79. DISASTER CAPITALISM: Klein, N. (2008). The Shock Doctrine. Penguin. LATIN AMERICA: Guardiola-Rivera, O. (2011) What if Latin America ruled the world? Bloomsbury | Galeano, E. (2009). Open Veins of Latin America: Five Centuries of the Pillage of a Continent. Serpent’s Tail.